Characteristics: It is a dwarf shrub that has small pinkish flowers and rapidly spreads. Growth & Spread: It is a fast grower. It can grow to heights of 0.7 – 1.0 m and is of a spreading habit, up to 2.7 m.
Flourishing Season: Beautiful pink flowers in late spring and early summer. Water & Maintenance: Water until established. It is a low-maintenance plant, which may require little to no pruning if planted in appropriate areas with sufficient spread spacing. 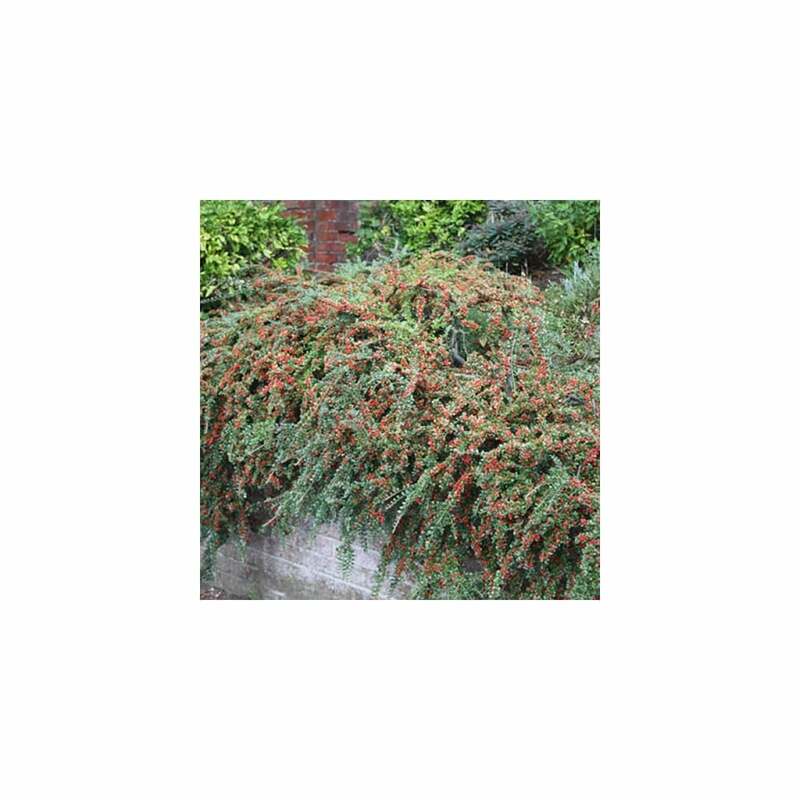 This dwarf shrub is deciduous and very hardy, withstanding almost any cold temperature. It has unique regular, flat branches that seemingly appear in a fishbone pattern throughout the plant. The leaves are dark, glossy green and about 1-2 cm in length. The foliage is especially impressive in the autumn season as the leaves change to vibrant orange and red to purplish colours. The light-pink, five-petaled flowers which appear in the spring will turn into small reddish fruits in the summer season. However, these fruits are inedible. It is commonly called rockspray, as after being established in rocky areas, it can tolerate poor soil conditions, drought and will continue to spread or “spray”. Although it can tolerate the extreme cold, it does not like hot summers. This plant is an excellent groundcover due to the density of its branches and leaves. As it also prefers sun, it works very well in landscaping open, sunny areas which are prone to erosion. They also do well in rock gardens or along walled areas.